“We are not considering banning domestic burning. The Government recognises that many households have installed wood-burning stoves, and the Government is not seeking to prevent their use or installation. But we are keen to encourage consumers to switch to cleaner wood burning, this will directly benefit consumers in their homes, as well as improving the local environment. We are considering how to encourage consumers to shift from burning the more polluting fuels such as house coal and wet wood, towards less polluting fuels such as low sulphur smokeless fuels and dry wood”. Our kiln dried logs have a moisture content between 10 – 15%. They will light more easily, burn consistently and cause little or no soot or deposits on your stove glass or chimney. Kiln dried logs burn hotter than less well seasoned alternatives. In addition, we primarily use Beech and Ash which you will find produce more BTU’s* per weight than other species. Ideally a log for burning should be no higher than 20% moisture content. This is achievable by air drying in the right conditions but takes skill and time. Ash may take 18 months but Oak as long as 3-4 years! Traditional methods of preparing seasoned logs can give you a very acceptable product but because it takes years to air-dry timber in this manner, you may find ‘seasoned firewood’ on sale isn’t what it seems. Testing with a moisture meter is the only accurate way to find out how much water is still inside the log. Beware that badly seasoned logs sold by the tonne may mean a substantial part of what you are buying is water (inside the logs) not heat producing timber. They will produce much more pollution and less heat. Why do our logs produce more heat? Simple. The drying process removes water. A fresh cut log may contain 50% water or more. For each 1 kilogram log, that would mean half a litre of water. With poorly seasoned timber, this means much of the energy contained in the log is used to evaporate the water, not to heat your room. Badly seasoned logs sold by the tonne may mean a substantial part of what you are paying for is water, not firewood. Kiln drying is a convenient and reliable process. Our logs are dry-stored on our barns afterwards so they stay in top condition until they leave our yard. The Kiln is fuelled with offcuts from the yard. This makes us more efficient economically and environmentally and provides a waste free process. We can give you advice on how to best store your logs. Ford Logs also build solid, long lasting log stores for optimum storage. 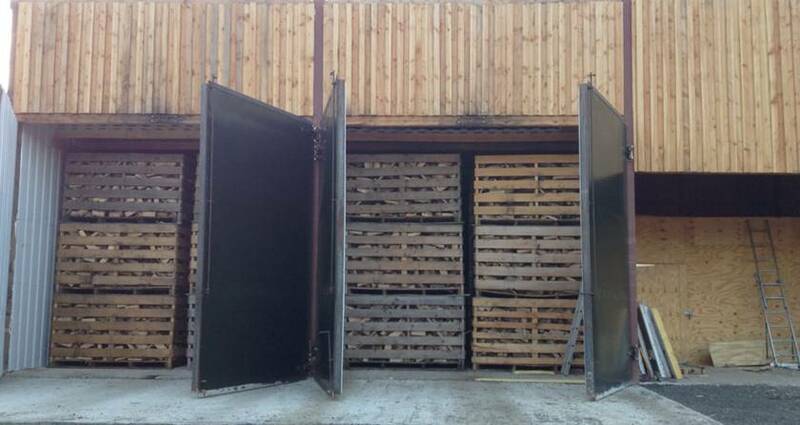 We design to suit your taste and advise the best place to locate your log store for best air-flow and protection. Contact us for more information. For more information about storing and using wood, check out this PDF from the Forestry Commission. Wood as a carbon neutral energy source. An interesting article from The Economist. *BTU British Thermal Unit. A standardised measure of heat output. Defined as the amount of heat required to raise the temperature of one pound of water by one degree Fahrenheit.